The story of Stern Grove. Western San Francisco has a few monuments that acknowledge local history (Portals of the Past in Golden Gate Park, for example), though many of our earlier times are best remembered by things that are missing—Sutro’s, Playland, Fleishhacker Pool, the outdoor mall at Stonestown, Parkside School, and even the iconic Zim’s restaurant that occupied the southwest corner of 19th Avenue and Taraval Streets for nearly 40 years. Happily, there is still at least one spot in the area that has remained essentially unchanged for many decades—Sigmund Stern Grove. Having grown up just a block away at 18th Avenue and Vicente Street, Stern Grove has been a part of my life for as long as I can remember. School outings, summertime concerts, and some teenage high jinks (though far more sedate than some recent misbehaviors by present-day local high school students) all come to mind, along with the inescapable smell of damp eucalyptus leaves. 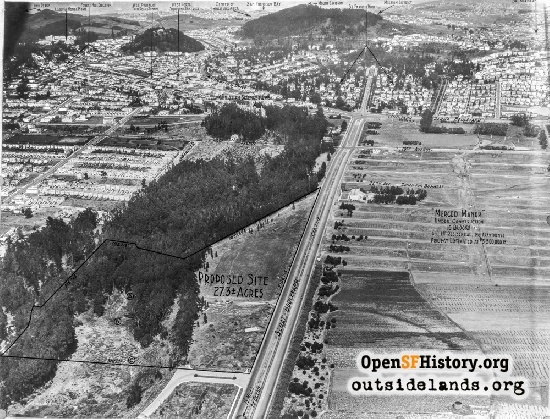 Tucked into a natural valley, 150 feet below grade at the northwest corner of 19th Avenue and Sloat Boulevard, the Grove has evolved slowly over the decades. In the 1850s William Green's brothers settled at the site, raising crops over a wide area of the neighborhood’s sandy soil. His brothers owned adjacent parcels, and the family’s holdings extended all the way to Ocean Beach. The home of George’s brother, Alfred Greene, is reported to have been shipped from the east coast of the United States, around Cape Horn at the southern end of South America, and is widely regarded as the first permanent residence built west of Twin Peaks. By the 1870s, eucalyptus trees were added as a wind-break around the area. Property ownership in the area was not always as simple as it is today. In disputes over ownership the Green family fought defending their land claims in “squatter wars” of the 1850s and 1860s. The family passed down colorful stories of building a metal-lined fort and fence lined with dynamite to keep from being evicted. 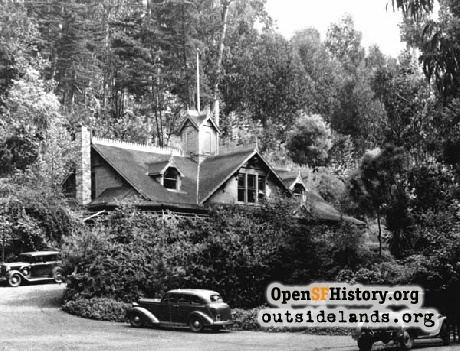 After selling parcels to the Spring Valley Water Company in the 1880s, the family’s last Lake Merced holdings consisted of the land around today’s Stern Grove. In 1892, Alfred’s son, George Greene, Jr., then in his early twenties, built the Trocadero Inn on the property. The remote site catered to San Franciscans who sought to escape the traffic and congestion in other parts of the city. Gambling, drinking, and various other pleasurable diversions were available to customers who frequented the inn. The building survived the 1906 earthquake, and one year later, it was the spot where corrupt city boss Abe Ruef, eventually found guilty of graft and corruption, was captured and arrested by the San Francisco Police Department. No doubt prompted by the post-fire “clean city” campaign, as well as the coming of Prohibition throughout the United States, George Greene, Jr. closed the Trocadero Inn in 1916, and converted the two-story Victorian building into his own home, where he was able to live comfortably for another 15 years without any hint of the noise and traffic that would one day come to the quiet intersection of 19th Avenue and Sloat Boulevard. Yet even beyond this early settlement by the Greene family, the site has several other links to local history. In 1902, Levi Strauss, founder of the firm that still bears his name, died in San Francisco. A life-long bachelor, Strauss left the company to his four nephews, Jacob, Sigmund, Louis, and Abraham Stern, the sons of his sister Fanny and her husband, David Stern. In 1928, Sigmund Stern, who had been born in San Francisco in 1857, died. His widow, Rosalie Meyer Stern, was persuaded by her long-time friend, Park Superintendent John McLaren, that a donation of open space in the rapidly expanding city would be a suitable memorial to her late husband. Mrs. Stern purchased the property from George Greene, Jr. (including the 1892 Trocadero Inn building that was then his home) and donated the parcel to the City and County of San Francisco in perpetuity, with the stipulation that the land “be used solely and exclusively for recreational purposes.” She secured the services of renowned architect Bernard Maybeck to design the amphitheater and to oversee minor repairs to the aging inn. At the dedication ceremony of Sigmund Stern Grove in June of 1932, there were various musical performances—a preview of what was to come in the summer of 1938 when the Recreation and Parks Department instituted a series of free summer musical concerts that continues to the present day, with recent attendance estimated at up to 20,000 people. 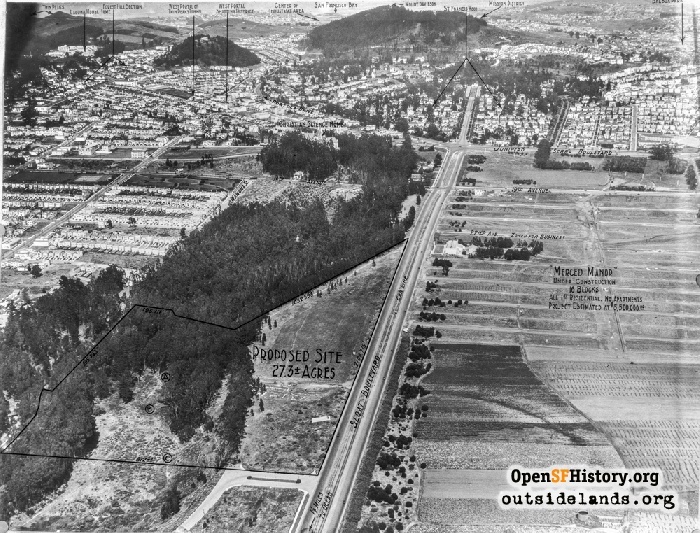 Shortly after the dedication ceremony, the San Francisco Rec and Parks Department began to acquire additional land, and, by 1938, the park’s size had been increased to 33.5 acres. Throughout the Depression years of the 1930s, the Grove was the site of significant construction activity by the Works Progress Administration (WPA). Various paths and retaining walls were built, and maintenance was performed on the 60-year-old eucalyptus trees. 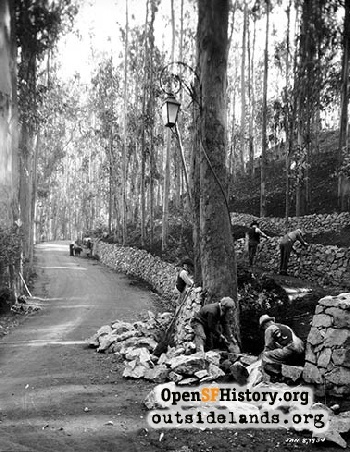 During the same years, WPA employed thousands more workers on other local projects, a few of which include: construction of the West Portal branch library, Laguna Honda Hospital, O’Shaughnessy Boulevard, Lake Merced Boulevard and John Muir Drive; the creation of multiple public stairways in hillside areas, various approaches to the new Golden Gate Bridge; installation of mosaics and murals at Beach Chalet, City College, and George Washington High School; cemetery removals in the Richmond District; plus extension of L-Taraval streetcar service to the Zoo. By 1999, it was determined that Sigmund Stern Grove needed serious renovations. Since the 1932 dedication there had been no significant improvements and much of the original infrastructure was deteriorating badly. In 2005, the project, designed by famed landscape architect Lawrence Halprin, was implemented, including drainage and erosion control, resurfacing of trails, construction of an expanded performance area, terraced seating built of stone walls and lawn, improved accessibility and restroom facilities, plus a new entrance plaza and signage arch. The $15 million required for these improvements was raised by the private Stern Grove Festival Association, and the entire renovation was funded completely with private contributions. The Association has a clear family lineage, going back to Rosalie Meyer Stern, who donated the land. Following Mrs. Stern’s death in 1956, her daughter, Elise Stern Haas, was named festival chairperson. In 1968, Mrs. Haas’ daughter, Rhoda Haas Goldman, was appointed, serving until her untimely passing in 1996, at the early age of 71. Her son, Dr. Douglas Goldman, a graduate of Lick-Wilmerding and Cal-Berkeley, was then appointed, and as he approaches his 65th birthday in 2017, he has quipped that it may be time for the next generation to take over, noting that his daughter, Jennifer, and twin sons Jason and Matthew, are now working members of the board—five generations of devoted family service to the people of San Francisco. Today, with the adjoining Pine Lake tract, the park spreads over 63 acres, bounded by Sloat Boulevard, Wawona Street, 19th Avenue on the east, and Crestlake Drive on the west. There are tennis courts, lawn bowling and croquet courts, golf putting greens, picnic tables, and a children’s playground for the public’s enjoyment. The Stern Grove tennis courts acknowledge the civic contributions of yet another notable San Franciscan who once lived nearby, Frances Twohig McAteer. Mrs. McAteer was the widow of long-time State Senator J. Eugene McAteer (for whom a high school campus was named), who suffered an untimely death exactly 50 years ago this May during his 1967 mayoral election campaign. She danced with the San Francisco Ballet as a child, excelled at golf and tennis as an adult, and was inducted into the sports halls of fame at her two alma maters—Mission High School and San Francisco State University. She later became the longest-serving member (21 years) of the San Francisco Recreation and Parks Commission, originally appointed in 1968 by Mayor Joseph Alioto, and serving until 1989. She remained active as a volunteer for several civic causes and committees until her passing in 2006 at age 90. 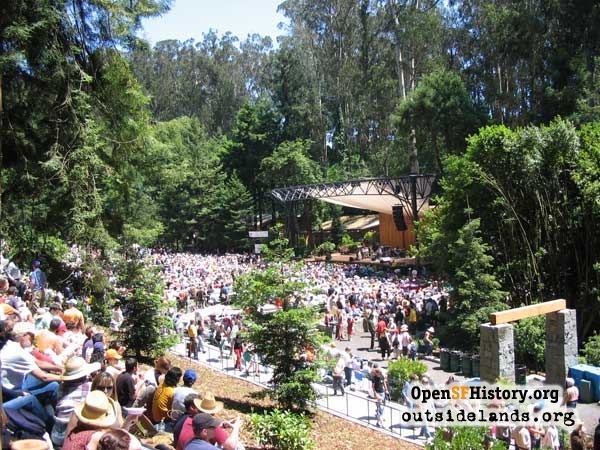 As we start the New Year, the Stern Grove Association is looking forward to its 80th season of free Sunday afternoon summer concerts among the eucalyptus trees. This year’s program is set to run from June 25 to August 27, and plans call for a wide variety of musical styles. 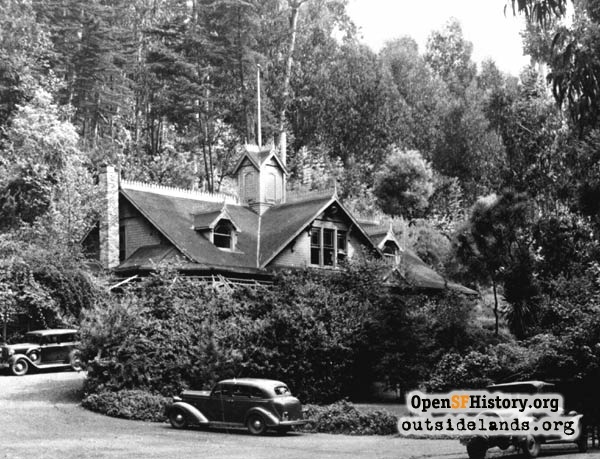 Today, the Trocadero Inn (also known as the Stern Grove Clubhouse) is managed by the San Francisco Recreation and Parks Department and remains available for private parties, receptions, and corporate events at very reasonable rates. Depending on the event, guests may have access to both the interior of the historic old building, as well as the adjacent grounds. Visitors to the inn are reminded to take note of the fact that the old double front doors contain a number of bullet holes from the building’s rowdier days. Although the structure is repaired and painted periodically, maintenance workers are reminded that these tiny symbols of the past must NEVER be patched or painted over—they are to remain in place, so that the site’s colorful past will always be preserved and remembered by current visitors. Page launched 29 January 2017.